One of the many inquiries we at the department field are for burn permits. This section is to help you in understanding the BURN PERMITS. Permits to burn outdoor waste, such as tree limbs, brush, etc. Permits to burn structures for demolition, such as houses, barns, etc. In accordance with State Statute 81-520.01 (1) There shall be a statewide open burning ban on all bonfires, outdoor rubbish fires, and fires for the purpose of clearing land. Before any open burning is done, a permit must be obtained from the local fire chief or his/her designee on a form prescribed by the State Fire Marshal. What this means is that if you desire to open burn, you MUST obtain a permit in advance and have it on your person when you are conducting the burn. The instructions on how to get a permit are in the "How" section below. State Statute 28-506 allows for "structures as condemned by law, structures no longer having any value for habitation or business or no longer serving any useful value in the area in which situated, and any other combustible material that will serve to be used for test fires to educate and train members of organized fire departments and promote fire safety anywhere in Nebraska" to be destroyed by burning. "Before the structure may be destroyed by fire for training and educational purposes" a permit must be obtained from the State Fire Marshal. The local fire chief must complete the first page of the permit. The second page requires the owner to give permission for the burn and their signature be notarized. What this means is that if you desire to demolish a structure by fire, you must contact us to get the paperwork started. It is understood that there is a place for open burning. Clearing ditches, removal of yard waste are just a couple. However there are many reasons why there are burning laws in place, for instance to protect you and your neighbors. With the dry weather that we can experience in our area, the vast amount of fuel (CRP ground, etc), and the population expansion; it is getting more and more dangerous for open burning. Therefore, the laws are in place to minimize the likelihood of problems associated with open burning. The burn ban stated above is a law. If you are caught burning without an approved permit, you are subject to punishment as dictated by the law. Please ensure the safety of you and your neighbors by allowing us to do our job to control the open burning process in our district. To obtain a permit for burning brush, yard waste, etc. Permits will only be issued in person on the Second, Third, and last Wednesday nights of each month, from 6:30 PM until 7:00 PM at the fire station. Please plan ahead when you are pursuing a permit. Our people are volunteers who have family, jobs, etc. and issuing permits is one of the many duties expected from these individuals. Be aware that when you request a permit, the department has the right to come on your property to inspect the proposed burn site and ensure you are following safe practices during the burn. Also be aware that YOU are responsible if the burn gets out of control. The weather. We will not allow burning when the winds are excessive or it is too dry. 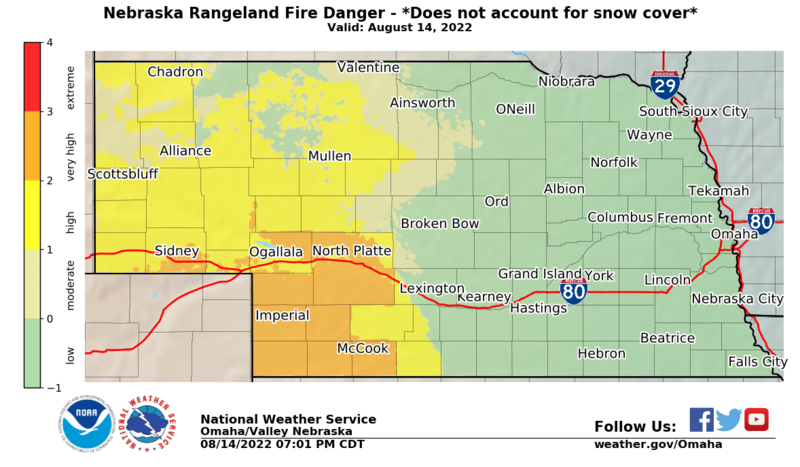 One way you can help in determining this is to go to http://www.weather.gov/oax/fire, click on "Grassland Fire Danger (Omaha), look for Washington County. If the index is very high or above, we will NOT issue permits. Any other index indication we will evaluate to determine if burning is allowed. Where you want to burn. The more dense the population of where you want to burn, the less of a chance that we will issue a permit. We will be asking you some questions to determine how safe your intended burn will be. Remember, THE PURPOSE OF THE CONTROLS IS TO PROTECT. If you have any questions or comments, please feel free to contact the Chief.